Are you going through a challenging life season and want to know where you can learn about joy in the Bible? I’ve summarized some Bible scriptures on joy into 5 simple truths below (you can also check out the list of Bible verses about joy here). God wants us to discover how to have authentic joy in every season (yes, even that really difficult one you’re going through right now)! Let’s learn more about what God says about how to find lasting joy. Before we go any further, perhaps you’re looking for a great Bible study on joy? I don’t just mean a collection of joy Bible verses. I mean a Bible study that will change your life and finally show you HOW to discover that joyful life God has for you? If so, you’ve got to check out the Joy Full 5Rs Bible Study™ Journal. Bible Joy Truth #1: Authentic joy and true happiness is found is God’s presence. I love that joy is the very essence of God’s character! 1 Chronicles 16:27 says that “strength and joy fill his dwelling.” Psalm 16:11 reminds us that joy and “eternal pleasures” are found in God’s presence. I love David’s personal testimony of authentic joy that he’s discovered as result of his time with God (Psalm 28:7 and Psalm 34:8). By spending time with God in prayer and daily Bible lessons, we can enter into God’s wonderful joy-filled presence and allow His truths about joy fill our hearts. Bible Joy Truth #2: Lasting joy is possible in every season when we follow God’s truths. Bible Joy Truth #3: Trusting God with our future brings undeniable joy and peace. It seems strange to find joy by trusting in someone else, but I’ve seen over and over in my own life that my deepest joy comes when I learn to just be still before God and trust that He is figuring everything out for my good. One thing I’ve learned about joy in the Bible is that God doesn’t promise that joy has to make logical sense for the circumstance. He just promises that He will provide it when we trust him (Proverbs 16:20, Psalm 28:7). Here’s a Bible verse about joy that beautifully illustrates this incredible truth: “You have turned my mourning into joyful dancing. You have taken away my clothes of mourning and clothed me with joy” (Psalm 30:11). “Those who plant in tears will harvest with shouts of joy” (Psalm 126:5). Friend, we don’t have to fully understand joy to be able to embrace it during life’s toughest seasons. That is one biblical truth about joy that I regularly cling to! Bible Joy Truth #4: Joy is an invaluable gift of God that radiates to others. Scriptures on joy like 2 Corinthians 6:10 remind us that we can have a broken heart but still have joy and give spiritual riches to others. I love that, don’t you? And I love how the psalmist describes God’s gift of joy as more precious than the most valuable physical gifts. Psalm 4:7 implies a celebratory aspect to biblical joy akin to a farmer’s great pleasure when gathering an abundant harvest. One of the greatest truths about joy in the Bible? Biblical joy is a gift that we don’t have to summon ourselves. 2 Corinthians 4:7-10 describes God’s followers as broken clay jars who have God’s radiant, joy-filled light shining through them.This Bible verse about joy clearly states that God uses life’s problems as proof that our Christian joy through trials is a gift from God (not something we’ve discovered on our own). Bible Joy Truth #5: Joy transforms our difficult circumstances into times of blessing. Of course it seems contradictory that joy would come during hard times! But that’s one of the best promises about joy in the Bible. 1 Peter 1:6-8 reminds us to choose joy, even during the most difficult trials. In fact, James 1:2-4 describes life’s troubles are “an opportunity for great joy” because times of trial bring incredible endurance to our faith. And one of my favorite Bible verses on joy is how life trials can bring great blessing because we know that God will use them as part of our future testimony (2 Corinthians 1:3-7). Now that you know these awesome biblical truths about joy, why not dig deeper into God’s word and really discover how to apply them to your life? I created the Joy Full 5Rs Bible Study Journal for this exact purpose. This six-week intensive Bible study about joy shows you how to not only understand what the Bible REALLY says about joy but apply 30 different joy Bible verses to your life! What keeps so many of us from finding true joy? We need to look to God’s word for answers (He wants to answer our questions and give us the gift of more joy!). And that’s exactly what the Joy Full 5Rs Bible Study™ Journal does. This one-of-a-kind joy Bible study helps you discover the answers to these common questions about joy by looking at Bible verses and biblical stories of those who also struggled with these issues. Then at the end of each week (in the “Reflect” section) you’ll find tons of great discussion questions and journal prompts here so that you can delve even deeper into the subject! The “Reflect” section also includes you’ll read real-world accounts from others in the Bible who also dealt with struggling to find joy. The Joy Full 5Rs Bible Study ™ Journal is perfect for anyone who really needs to develop a godly perspective on joy–and find joy in all circumstances! Want to give this amazing joy Bible study journal a test run and see if it will help you find more happiness and joy? Give the Joy Full 5Rs Bible Study™ Journal and Guide a test run with this free sample. I hope you learned something new about joy in the Bible from this post! Can I encourage you to take the next step? Why not get started today on your journey to more joy with the Joy Full 5Rs Bible Study™ Journal? Let this powerful joy Bible study teach you how to discover joy–even during life’s most challenging circumstances. Call upon His name, trust in His promises, and let these truths about joy in the Bible change your life today! 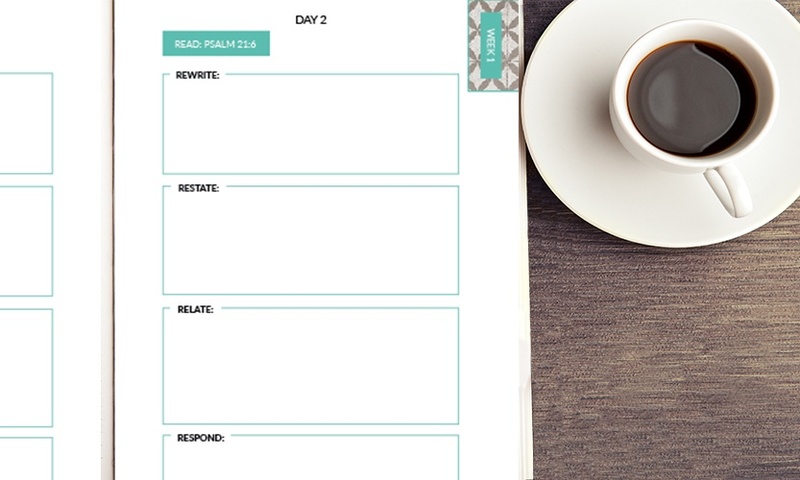 And, if you’d like to give the Joy Full 5Rs Bible Study Journal a test run, don’t forget to download the free sample (the first week of the Bible study)!